Martin Birch - a British Producer, Sound and Mixing Engineer. In the late 1960s until the end of the 1970s he has worked with British music bands like: "Fleetwood Mac", Rainbow , " Deep Purple " (11 Albums), "Wishbone Ash", Whitesnake , "Jon Lord", " Black Sabbath ". In the 1980s (until 1992) he was dedicated working with "Iron Maiden" (9 Albums) . Martin Birch has used many different nicknames. Nigel Hewitt a British Sound Engineer who has (during the 1980s) engineered vinyl albums for heavy metal bands like: Def Leppard, Iron Maiden, Dio, Mammoth and others. Robert Ellis a British photographer , active since the 1970s and working for several leading Music related magazines like NME (New Musical Express), Melody Maker, Kerrang, Sounds. 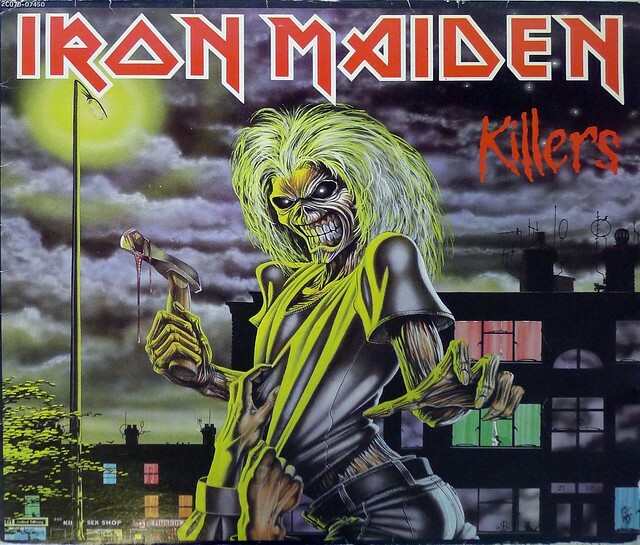 High Quality Photo of Album Front Cover "IRON MAIDEN KILLERS FRANCE "
Album Back Cover Photo of "IRON MAIDEN KILLERS FRANCE "
Dave Murray a British Guitarist known for playing in "Iron Maiden". Before joining the "Iron Maiden" band, Adrian Smith and Dave Murray played together in the "Stone Free" and "Urchin" band. Paul Di'Anno Lead vocals with Iron Maiden from 1978 until 1981. In his post-Maiden career, Di'Anno has issued numerous albums over the years, as both a solo artist and as a member of such bands as Gogmagog, Di'Anno's Battlezone, Praying Mantis, Killers, and Rockfellas. Steve Harris (Bass player) is founder of the British Heavy Metal (NWOBHM) "Iron Maiden" in 1975 and has been Mr "Iron Maiden" since. Adrian Smith - Guitarist with the British Heavy Metal band "Iron Maiden" . Adrian Smith" started his musical career in the Urchin band and performed with "Iron Maiden" from 1980 until Today with several breaks in between. 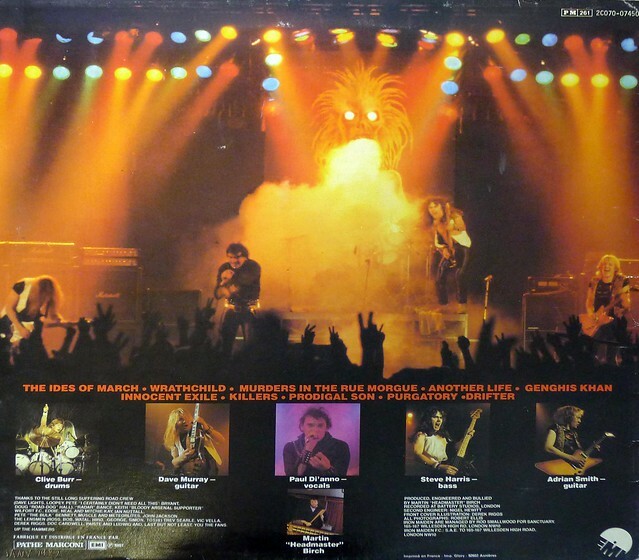 Before joining the "Iron Maiden" band, Adrian Smith and Dave Murray played together in the "Stone Free" and "Urchin" band. 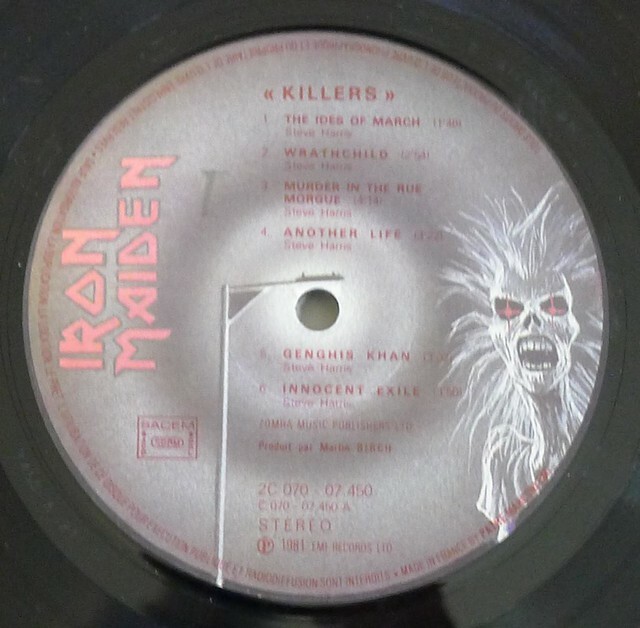 Complete Track-listing of the album "IRON MAIDEN KILLERS FRANCE "